Ricky Gervais on Atheism. Ricky Gervais says his mom only lied to him about one thing, god! Very funny! 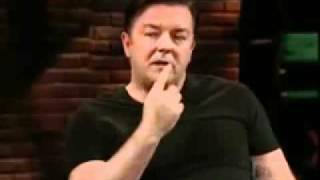 Gervais talks about when he found out he was an atheist. His first mistake was a talking snake....lmao (Ricky Gervais on Atheism .....this is funny: http://t.co/8skKDXK4 via @youtube...)... more... No comment yet. Feb 23, 2012 · All the funny jokes, pranks, pictures, cartoons and videos to brighten up your day. Ali G - Religion Roundtable - Funny!!!!!! Ricky Gervais on CNN: "Atheism: Why jokes about God shouldn't offend believers"